from across America and Canada. One of the great people I met there was Rabbi Avi Berman, director of the Orthodox Union in Eretz Yisroel. 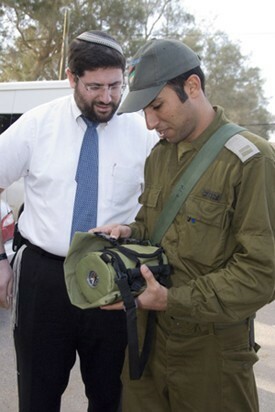 Among his other important work, is Rabbi Berman’s involvement with Israeli soldiers. When soldiers of the Israel Defense Forces went into combat against Hamas in Gaza a few years ago, he spearheaded the dissemination of tefillin to over a hundred soldiers who were interested in adding a spiritual component to their weaponry. After the operation in Gaza concluded, the OU continued to be in contact with the soldiers who had received the new pairs of tefillin. During the Shabbos I was in Eretz Yisroel, we had the privilege to eat Shalosh Seudos at the home of Abba and Pamela Claver. The Clavers live in the Jewish Quarter of the Old City of Yerushalayim, and their rooftop provides a magnificent view of the Kosel and the Temple Mount. But what made the experience truly special was the fact that we ate together with a regiment of religious soldiers. In fact, we sat interspersed among the soldiers, and had a chance to get to know them. One of the highlights of the seudah for me was when we sang the aforementioned "עם הנצח" together. Defending Eretz Yisroel, being, and living, as a Torah Jew, and seeking to gain any level of mastery in Torah study, the noblest pursuit of all, all entail perseverance along “the long road”. The eternal people must always proceed without fear! The nation stood at the threshold of Eretz Yisroel, their entry into the land imminent. Twelve of the greatest leaders of the nation, one leader representing each tribe, were dispatched to survey the land. The results of that mission were catastrophic. Ten spies reported that the inhabitants of the Land were possessed insurmountable strength, and were impregnable. Two spies however, returned preaching that they would be able to vanquish the inhabitants, despite the odds. Rabbi Shlomo Wolbe zt’l explained that one’s level of bitachon in G-d is based on the context of his perceived relationship with G-d. If one truly believes that G-d loves him, he will relate to the events of life with a far more optimistic attitude, than one who believes G-d is ‘out to get him’ (heaven forefend). On their great level, the ten spies felt a certain spiritual/psychological aloofness from G-d. They did not feel worthy enough of G-d’s love and protection. Therefore, when they saw the challenges they would face upon entry into the land, they saw them as impending disasters. Yehoshua and Calev however, saw the same land through a lens of closeness to G-d. Their bitachon in G-d was whole-hearted, and they felt that G-d’s love for them, and all of Klal Yisroel, was uncompromised and unconditional. Therefore, when they viewed those same challenges, they saw them as opportunities that would undoubtedly yield Divinely-ordained victories. Rabbi Matisyahu Salomon shlita, the Lakewood Mashgiach, noted that in Israel today there is a “Sar Habitachon - Minister of Defense” who is in charge of ensuring the security of the country. But Torah Jews have greater confidence in the “Sha’ar Habitachon”. It is our sense of bitachon that grants us the ability to feel a sense of security and tranquility in an insecure world. Rabbi Salomon continued by quoting a poignant thought from Rabbi Simcha Zissel Ziv, the Alter of Kelm: It is commonly believed that the difference between a hero and a coward is that the coward is beset by fear, while the hero is not afraid. But this is a fallacy. If the hero indeed had no fear, either he would not proceed into battle in the first place, or even if he did, he would not fight with adequate gusto and determination. In truth, both the hero and the coward may be intimidated and frightened by the prospects of the unknown they are facing. The difference is however, that the coward flees from the source of his fear, while the hero is propelled forward despite his fear. Both are afraid, but the coward is paralyzed by his fear and seeks avoidance, while the hero is more driven with confidence to confront his fear with every asset available to him. The coward seeks the path of least resistance, while the hero relentlessly readies himself for a long arduous journey. To become a hero, one must feel that sense of security which breeds optimism and hope. To have that level of bitachon in G-d there must be requisite feeling of connection with G-d, and a penetratingly deep realization of how much G-d loves him. The roads of life are daunting and ominous. But when one feels securely in the Hands of G-d he can proceed, because he is not afraid to confront fear itself! This well known song sung by religious soldiers was written during the Disengagement from Gaza by the settlers as they were being evacuated. It is sung to the popular tune commonly sung to the words, “Oz V’hadar l’vushah”. Bitachon is the highest level of trust in G-d. It is a deeper and higher level than emunah (faith). Bitachon literally means security; one who has bitachon in G-d feels completely secure no matter what happens to him because he sincerely feels that he is in G-d’s Hands. Chazon Ish explains that emunah is an intellectual belief, while bitachon is an emotional belief, and therefore is much stronger. The Chofetz Chaim develops this idea at length. He explains that the spies felt misplaced humility, figuring that they were unworthy of divine intervention and miracles. The Chofetz Chaim continues that this is a common tactic of our own Evil Inclination; he seeks to make us feel unworthy and distant from G-d, which in turn affects all of our Service to G-d.